Beginning with its premiere performance of Pelléas et Mélisande in 1925, the Metropolitan Opera has consistently lavished first-rate conductors and singers on Debussy's enigmatic masterpiece. Indeed, for the current revival, the cast was close to ideal (with one important exception) and the singing was spectacular. The biggest news, however, has been the much belated house debut of Sir Simon Rattle. Though he cleverly sought to appear from the darkness and begin the opera without any hint of entrance applause or disruption, it was clear from the outset that the audience was primed to shower him with ovations. 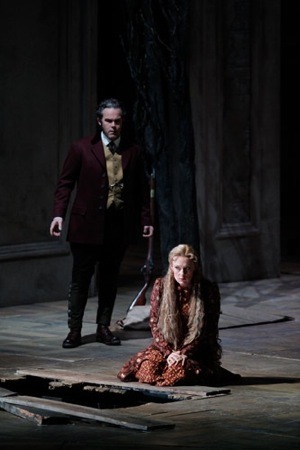 At the close of Act 1, despite Rattle's intention to continue directly with Act 2, some fervent listeners insisted on an ill-advised smattering of applause. And so it continued, act by act, until finally, the full-force torrent of appreciation was unleashed at the conclusion of the opera. Part of the affection emanating from the audience must certainly have been due to the cumulative total of Rattle's distinguished career. But added to this, and taken on its own terms, his conducting of Pelléas was magnificent: rich in details, marvelously controlled, and profound in its silences. It would be impossible to ask for a conductor to highlight both the instrumental details and the impressionistic aspects of Debussy's orchestrations. To a degree, these are opposing goals. While Rattle strove for admirable calm and precision, thereby illuminating fascinating shreds of melody and glinting tonal colors, I felt the grand sweep of Debussy's spirit failed to come across. To use a simplistic analogy: it was like viewing a Monet up close rather than from a comfortable distance. The effect was surpassingly beautiful nonetheless, and the instrumentalists were inspired to a high level of virtuosity. Pelléas is a difficult work – a singularly impressionist, multi-layered opera that can be interpreted along many different angles and contains so much musical and textual detail that no single production could possibly do justice to all of Debussy's demands. Just as the composer toiled arduously to stay faithful to his own Symbolist ideals, so too must the singers delve deeply into their characters to illuminate the glowing facets of human emotion buried therein. And even when the singers successfully bring their roles to life, there are always details lost, emotions neglected, and words gone for nothing. Only the listener's imagination can fill in the gaps and shed the light of understanding on the gloomy haze of Maeterlinck's narrative. Debussy himself was dismissive of his own potential audience, and said that opera should be protected from "…the herd of people who treat [music] as casually as they do a handkerchief!" Some of his fears were well founded on New Year's Day, to judge by the chuckling at inopportune moments (the dropping of the ring, the unfurling of the hair) and almost incessant coughing. But the musical value of the performance easily transcended these human distractions and confirmed the spiritual, transporting quality of Debussy's fleeting melodies. 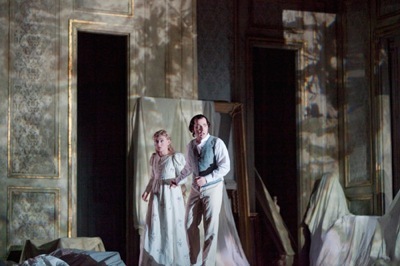 The only disappointment among the cast was a critical one: mezzo-soprano Magdalena Kozená's Mélisande. Despite the audience's thunderous applause at her curtain call, I remained unconvinced. Her singing, per se, was firm, on pitch, and intelligently phrased (her frequent use of sliding straight-tones notwithstanding). Having enjoyed several of her recordings, it was gratifying to confirm that the unique, instantly recognizable timbre of her voice remains intact. It's an affectingly warm sound, and she is able to vary the tone through a wide range of colors, giving vibrant life to many of her words. Her French diction was passable, but not in the same league as Dessay on the recent Virgin DVD (reviewed here). For my own preference, a lighter vocal palette – more soprano-like – suits the character better, but there is no denying Kozená's musical mastery of the role. As an actress however, she nearly sabotaged the entire spectacle. There are many different ways to depict Mélisande: naïve, otherworldly, innocent, weird, sullen, flighty, and so forth. Kozená seemed to lack any kind of commitment to the character: she was simply blank for much of the opera. Thus, the critical chemistry between Pelléas and Mélisande was all but nonexistent (despite the sincere efforts of superb baritone Stéphane Degout). Only in the final two acts did Kozená start to imbue Mélisande with anything resembling a point of view. Unfortunately, her laughably stock gestures (e.g., hands to neck when being threatened by Golaud) were also a significant detraction. She was at her best in the final scene when, confined to the bed, she sang a stylishly diaphanous death scene. Baritones Stéphane Degout (Pelléas) and Gerald Finley (Golaud) are likely the finest current interpreters of their roles. This was ultra-luxurious casting: it was a marvelous pleasure to hear so much elegant, yet characterful, full-blooded baritone singing. Degout is what one might call the ideal ‘baryton Martin' with a gorgeous, tenorial high register coupled with a slender, reedy low voice. Armed with rock-solid technique, he mastered every vocal hurdle with élan and managed to seem utterly relaxed and thoroughly immersed in his character. Both he and Finley used the French language to expert effect, with impeccable enunciation and vowels tinted to suit the emotional currents of Debussy's ever-shifting tonalities. Compared with his impressive turn as Pelléas on DVD, Degout seemed slightly hampered by Kozená's reticence in their scenes together. Nevertheless, his dashing, conflicted young man looked handsome, moved gracefully, and made the perfect foil for Finley's equally outstanding Golaud. Golaud is arguably the most complex and challenging role in the opera, requiring extreme emotional shifts and significant character development over the course of five acts. As with his previous roles in this house, Gerald Finley once again offered a thrilling impersonation of the tragically heart-broken, semi-crazed older brother. Among recent interpreters of Golaud at the MET, stands the great José van Dam. Finley must be counted as equal to his esteemed forebear – perhaps even surpassing the Belgian by virtue of his richer tone and slightly more volatile physicality. With blazing vocalism, refined phrasing, and self-contained dignity – even during Golaud's most pathetic ramblings – Finley managed to elevate his character's plight to almost mythic proportions, garnering the fullest sympathy (and gratitude) from the audience throughout. Felicity Palmer offered a thoroughly convincing Genevieve, with her customary attention to textual detail and touching maternal warmth. 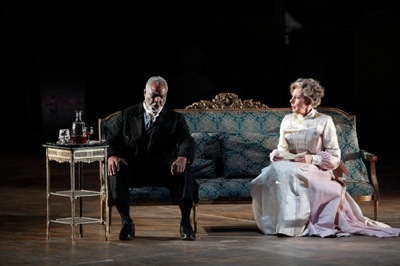 Willard White (also a previous Golaud at the MET) started rather stolidly, but proved tremendously effective in all his scenes with Mélisande – the final act in particular. He is a handsome man, and unfortunately didn't look convincingly old enough to be a father figure for Genevieve and grandfather to Pelléas. His singing was rich and powerful, effectively anchoring the vocal line and helping to give credibility to his character's patriarchal status. Special praise goes to boy-soprano Neel Ram Nagarajan who sang Yniold's challenging music as perfectly as one could desire. The audience warmly cheered for him at the conclusion. Since this was not a new production, it should suffice to mention that John Conklin's rotating unit set is holding up quite well since it's initial unveiling in 1995. Pelléas involves fifteen scenes spread over five acts, and the associated set changes are daunting to say the least. The single, architectural set was designed to faithfully depict the interior of a vast, country estate. Thus, such settings as cliffs, a cove, a forest, and so on demand a good deal of imagination from the audience. The visual effect failed only once: the scene in Act 3, when Golaud threatens Pelléas in the vaults below the castle was utterly unconvincing. Jonathan Miller's direction gave the singers plenty of latitude for natural movement and freedom on the stage. There were certainly awkward moments: the fratricide didn't work very well, for example, with Finley slowly sneaking up on the lovers. I must also mention that Kozená was extremely ill at ease in the scenes where she drops the ring into the fountain and where she lets down her hair from the terrace. The latter, in particular, seemed clownish to the point of eliciting widespread laughter throughout the audience. The costumes by Clare Mitchell fit the mood nicely, even if Mélisande's rather ugly black dress might have found a better home elsewhere. Duane Schuler's lighting was ideal – no small feat in such a gloomy opera where it would be easy to shroud the singers in darkness much of the time. In sum then, my reservations are quite minor in view of the overall achievement. Pelléas et Mélisande is an amazing testament to Debussy's intellect and talent, and should always be presented with such high standards of artistry. Join the debate: if you have any comments on this or any of our articles, visit our forum.